When I read John 15:9-17 I find myself reading it in many different tones. So far, my favorite is to read it in is exasperation. You the super-exasperated “I love you” that is sometimes the best you have to give one another. Its a favorite of my husband and I’s, we will be completely be put out with each other and say “I love you” in that super annoyed tone. Its the thing we say when we are out of words, and really don’t get each other. Its the I-love-you-and-I’m-tired-of-disagreeing-but-don’t-want-to-give-in-but-I-realize-love-is-more-important-than-winning type of I love you. Because what Jesus is doing here, is he’s building an argument, and apologia, a stack of evidence about love; I can’t even believe I have to tell you this but…God really, really loves you. The next chapter Jesus goes on to explain that he is telling the disciples all this to “Keep them from Stumbling/” He knows we need to hear the love. Essentially, I feel like Jesus is saying “Look, I want you folks to work on loving one another, because now you have seen love. You have seen how much I love you. In fact, I love you not as my followers or servants, but as my friends. And the reason I’m willing to risk everything, the reason I’m willing to lay down my life for all of you, is because I love you. So I want you all to continue practicing this love. Not so much because I’m making/ordering you to do it, but because I love you.” Love for the sake of love. That is all Jesus is asking of us. We call this the greatest commandment (because Jesus gave it to us as such), but Jesus hope we get beyond this. Jesus wants us to practice love so much, that we aren’t just loving because Jesus has told us to, but because love is an essential part of our living and being. If John 15 is the argument for love then 1 John 5:1-6 and Acts 10:44-48 could be easily read as the illustrations. 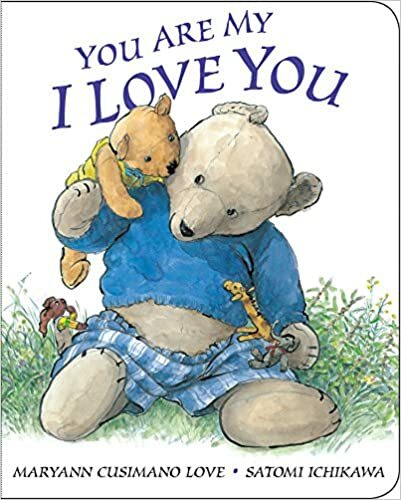 You are My I Love You by Maryann Cusimano Love is a good book that also ties it all together. Both passages relate to baptism as an indicator/seal of God’s love, the outpouring of God’s love is made evident after the resurrection of Jesus Christ through the Holy Spirit. 1 John 5 casts love as that the child has for a parent. This love is commanded, but not a burden (an interesting statement in contrast to Jesus’s wish that we don’t just love God because we’ve been commanded to). in 1 John 5, we are all children of God. The transactional piece of worship is being transformed. We serve and worship out of love, not just duty. In Acts 10 the Holy Spirit spills out, uncontrollable, not particular, touching all types of people. This outpouring of indiscriminate love is confusing, us humans are not good at loving this way. (Although children tend to be good at it, so your back to 1 John 5). Paul asks “Can anyone withhold the water for baptizing these people who have received the Holy Spirit just as we have?” Can anyone deny these people are beloved? Can anyone stop this spilling of the Holy Spirit? Paul’s question brings us up short, because it reminds us that not only should we not prevent baptism, why would one want to? Here we see where our love might not extend as far as God’s. Here we might be able to discern where we love out of duty, and not out of abundance. I think at times, love does fail. How do we handle that as humans? Psalm 98, I like to think of it as the Joy to the World psalm, speaks of a new song that we will sing to God. Could it be this new song is the new ways we are taught to love? Could it be that God’s love is transforming us to live and move and be in new ways? This psalm speaks of God’s judgment, but we can refer back to the other three passages and know that God’s judgement is founded in God’s love. “He has remembered his steadfast love and faithfulness to the house of Israel.” Perhaps God is forever teaching us new ways to say our “I love yous.” Sometimes, we need to remember that there is more than one way to express love, because when we forget, we limit love. I think the Psalm shows us both that love is renewing, and love can be told in new ways. How do you say I love you? What does it mean if Jesus is God’s Love Language? Where do you see God’s love in your life? When has love taken you by surprise? What are new ways of loving that you have learned? Are there languages of love that speak to you, even though you might not ever do love that way? When love fails you what do you do? Let us know what questions your pondering this week as you meditate on the RCL Scripture, or maybe you have it all figured out! Share about that too, we’d love to hear where you are! Katy Stenta is a solo pastor at a tiny church that is bigger on the inside in Albany, NY which she has been enjoying for over seven years. When she is not dreaming up projects and ideas, some of which creep into the church, she plays with her three boys-boys or goes and visits her husband at the library, while he works, to read. I didn’t do the Vine parable last week, so I’m combining all of John 1-17 this week…and wondering what I’ve gotten myself into. Yet I felt like you can’t talk about one without the other so I needed both. If I were smart I might have just moved everything back a week and skipped later in the lectionary. Oh well. Katy, I really appreciate your reflections here. Thank you!